Acute respiratory distress syndrome (ARDS) in young infants is linked with a pulmonary inflammatory response part of which are increased interleukin-8 (IL-8) levels and migration of polymorphonuclear leukocytes (PMNL) into lung tissue. A topical application of an antibody against IL-8 might therefore decrease PMNL migration and improve lung function. Randomized, controlled, prospective animal study. Research laboratory of a university children’s hospital. Anesthetized, mechanically ventilated newborn piglets (n=22) underwent repeated airway lavage to remove surfactant and to induce lung inflammation. Piglets then received either surfactant alone (S, n=8), or a topical antibody against IL-8 admixed to surfactant (S+IL-8, n=8), or an air bolus injection (control, n=6). 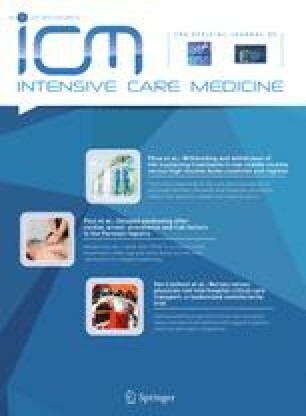 After 6 h of mechanical ventilation following intervention, oxygenation [S 169±51 (SD) vs S+IL-8 139±61 mmHg] and lung function (compliance: S 1.3±0.4 vs S+IL-8 0.9±0.4 ml/cmH2O/kg; extra-vascular lung-water: S 27±9 vs S+IL-8 52±28 ml/kg) were worse in the S+IL-8 group because reactive IL-8 production [S 810 (median, range 447–2323] vs S+IL-8 3485 (628–16180) pg/ml; P<0.05) with facilitated migration of PMNL into lung tissue occurred. Moreover, antibody application caused augmented chemotactic potency of IL-8 [linear regression of migrated PMNL and IL-8 levels: S r 2 =0.30 (P=ns) vs S+IL-8 r 2 =0.89 (P=0.0002)]. Topical anti-IL-8 treatment after lung injury increases IL-8 production, PMNL migration, and worsens lung function in our piglet lavage model. This effect is in contrast to current literature using pre-lung injury treatment protocols. Our data do not support anti-IL-8 treatment in young infants with ARDS. The surfactant preparation used in this study (Curosurf) was generously provided by Nycomed, Unterschleissheim, Germany. The authors are indebted to Jürgen Schulte-Mönting for statistical advice.